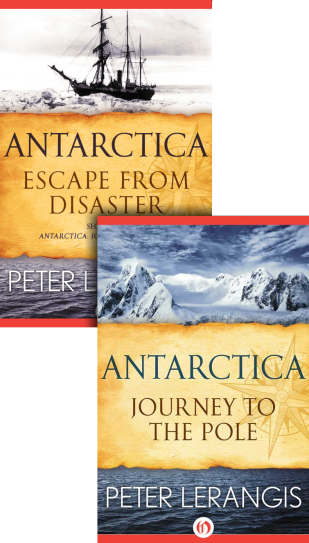 Antarctica is a two-part story of a fictional “lost” American voyage to the South Pole. What happens when a twice-widowed explorer, Jack Winslow, mounts the most dangerous and exciting American voyage in history, and must bring along his two teenage sons — along with the evil nephew of the voyage’s financier? There’s a stowaway, a mutiny, an amputation — and several people who aren’t exactly who they say they are. And that’s about all I’ll give away now! I’m proud to say that the 1000640http://www.jason.org/public/whatis/start.aspx JASON project (brainchild of Robert Ballard, who discovered the wreckage of the Titanic) included Antarctica as one of the five top books for kids in their unit on Polar Regions. Although the original series is out of print, eBooks are now available! Please use the links at the right to order. I’ve also provided links for second-hand print copies of the original series. Please note: These books are out of print, but you can buy from the Amazon third-party sellers in the top link above. AddAll.com (the bottom links) is not a seller, but rather the best search site for used-book sellers.